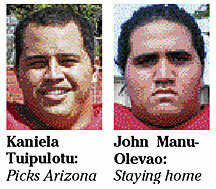 Arizona had an interesting advantage in the recruiting of Kahuku star defensive tackle Kaniela Tuipulotu. Tuipulotu, one of four Red Raider football players to make oral commitments to colleges yesterday, chose Arizona over Hawaii, Oregon State and Utah. One of the Wildcats' most prominent former athletes -- who also happens to be an NBA player and the son of one of the greatest centers in college basketball history -- is Tuipulotu's first cousin. Luke Walton of the Los Angeles Lakers -- son of Hall of Famer Bill Walton and Tuipulotu's mother's sister -- spoke Wednesday with the All-State defensive lineman from Maui. "I talked about it with Luke and he told me Tucson's a great place to be," said Tuipulotu, who also said he enjoyed his recruiting visit there. It wasn't the lone deciding factor, but it helped Tuipulotu make his decision. "Arizona looks like a good place for me for a lot of reasons," the 6-foot-1, 291-pound athlete said. The prospect of immediate playing time was another factor. "They've got two guys (at defensive tackle) coming back, so I probably won't start, but there's an opportunity to be in the rotation," Tuipulotu said. USC also expressed interest last week. Tuipulotu has a cousin connection there, too (junior linebacker Kaluka Maiava), but the Trojans waited too long to get into the mix. "USC called and said they liked my film," Tuipulotu said. "But I realized it was too late for them. The other schools were recruiting me from my junior year, so it would be unfair to them." USC -- which didn't offer a scholarship -- wanted Tuipulotu to wait until head coach Pete Carroll could be reached to approve a visit this weekend, Kahuku coach Reggie Torres said. Tuipulotu wanted to get the process done with, and committed to Arizona assistant Mike Tuiasosopo yesterday morning. "He loved what UH had to offer, and (defensive line coach) Jeff Reinebold was great, but he wanted to go away," Torres said. Tuipulotu said he has a qualifying entrance exam score and grades. Another Kahuku lineman, offensive tackle John Manu-Olevao, has accepted a scholarship offer from UH, Torres said. However, Manu-Olevao might not qualify for enrollment at Manoa this fall, Torres said. Torres said Weber State, UNLV and Arizona "showed some interest" earlier in Manu-Olevao, who was listed at 6-foot-3 and 298 pounds before the season. Junior college remains an option, as does working on grades at another four-year school that doesn't have football in order to meet UH's entrance requirements. "It all depends on his grades," Torres said. "At least UH is willing to help him." Also, Red Raiders linebacker Sifa Heimuli (5-11, 210) and defensive tackle Malone Fiso (6-1, 260) committed to Weber State yesterday. "I have a lot of family within 10 minutes of Ogden," Heimuli said. They include his uncle, former Kahuku and BYU star Lakei Heimuli. Fiso said Weber State seemed like home away from home when he visited. "There's a lot of other local boys there and they stick together," Fiso said. Heimuli and Fiso both said they are set with test scores and grades. Manu-Olevao and Kahuku quarterback Richard Torres are among the players making official visits at UH this weekend.